During winter we make so many special recipes which are healthy and give warmth and energy for the cold weather. 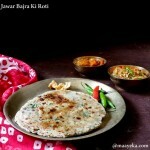 Bajra is very popular in North India specially in the states of Gujarat, Rajasthan and Uttar Pradesh . There are so many recipes to make with Bajra- Roti ,parathas vada,rice and this bajra khichdi is the most popular one among the other delicious recipes. 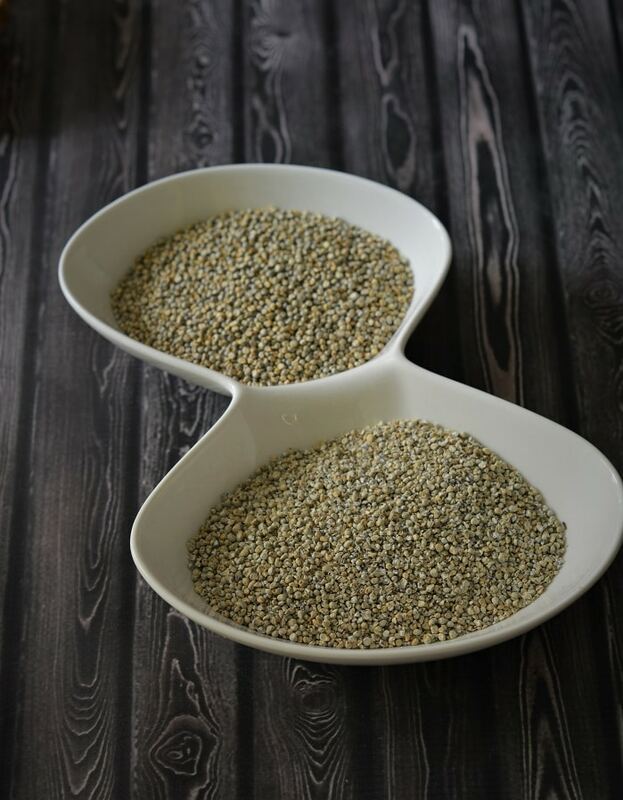 Bajra or pearl millet is very good for diabetic people, it helps in digestion, detoxify your body, prevents asthma, its heart healthy and reduces cholesterol and blood pressure,high in protein and fiber. so do try to include bajra in your diet regularly. 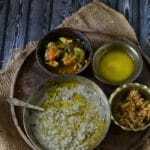 The making of Bajra khichdi is quite easy and simple but first we have to prepare the bajra for making khichdi .You can’t add the whole bajra directly in the khichdi. The outer husk should be removed as it has a slight bitter taste and whole bajra took quite a long time to cook and digest. So first of all little water is sprinkled on the whole bajra and then set aside for an hour. Then the bajra is slightly crushed using the mortar and pastle or using the hamam dastato lossen the husk . Now every one don’t have the access to the hamam dasta so we can use mixer and gently pulse bajra few times. Then the bajra husk is removed by winnowing. Then it is again put in the mixer and pulsed few times to make into slightly coarse powder. Then the bajra is ready to make the khichdi. Now just add the ready bajra ,moong daal ,little rice aand lots of water and cook till done. 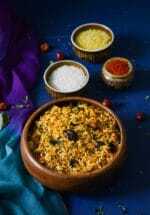 Traditionally only salt is added in the khichdi and served with lots of ghee on top. 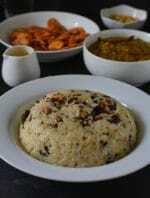 Traditionally bajra khichdi is made with bajra and a daal . but the proportion and choice of lentil differs in each region and each family preference. 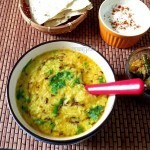 Green moong daal chilka/ moth ki daal and even chana daal is added with bajra . 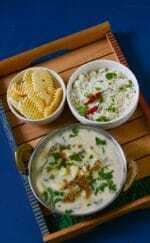 Addition of little rice is optional but preferred as it gives a nice creamy texture to the khichdi. You can also add turmeric, asafoetida, ginger and green chilies to enhance the taste. You can also add mixed vegetables and give a tadka of cumin and asAfoetida to make it more interesting. But the plain rustic khichdi have its own delicious taste. Do try this healthy delicious khichdi this season. 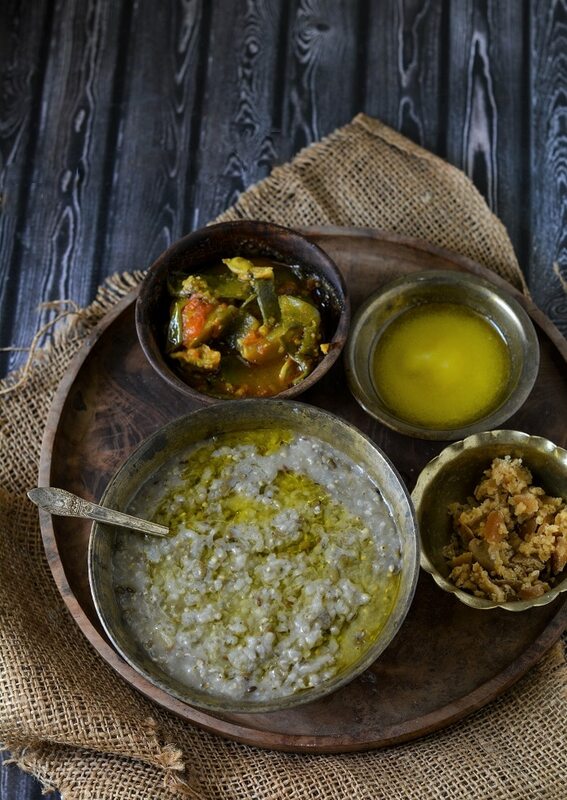 Traditionally Bajra khichdi is served with ghee and crushed jaggary. But if you don’t want to have jaggary then you can also serve it with khatti dahi ki kadhi , buttermilk, salad or even with a sabzi as per your taste preference. First of all little water is sprinkled on the whole bajra and then set aside for an hour. Then the bajra is slightly crushed using the mortar and pastle or pulse in the mixer few times to loosen out the husk. Then take out the bajra in a plate and gently crush with your hands and then the bajra husk is removed by winnowing. Then it is again put in the mixer and pulsed few times to make into a slightly coarse powder. Wash the moong daal chilka and rice and keep aside. When the cooker cool down completely then open it and mash it slightly. Add chopped ginger,salt , 2 tbsp ghee and some more hot water to adjust the consistency and then simmer for 10 minutes. Serve hot with lots of ghee on top. 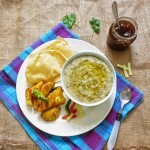 Serving Instruction- Bajra khichdi is best served with either jaggary and ghee or with khatti kadhi or buttermilk.